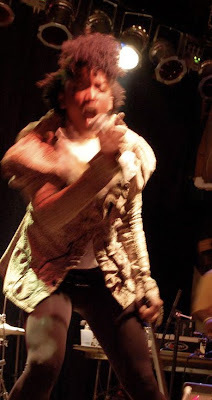 Undercover Black Man: Playlist: Black rocker chicks rock! Playlist: Black rocker chicks rock! Will the Twenty-Teens be the decade of Black Rocker Chicks? Surely a lot of talented black women – more than ever before, it seems – are going the indie-rock route. Even if very few of them get famous. Here go some more, streaming on my Vox blog. God bless ’em for doing their thing. 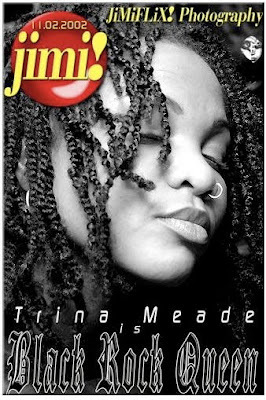 Atlanta’s Three5Human is fronted by vocalist Trina Meade, a.k.a. Black Rock Queen. I got turned on to Brooklyn’s Tamar-kali by one of my readers, daughterofthedream. I blogged about Tamar-kali in 2008. This cut, “Pearl,” is brand new. According to Rob Fields, the must-read music blogger at Bold As Love, Tamar-kali’s new album – “Black Bottom” – is due out next spring. Res is another artist I stumbled upon at Bold As Love. You can download Res’s new album, “Black.Girls.Rock!,” for free. Just follow this link to her homepage, and peep the lower left-hand corner. More FREE MP3s... this time from Atlanta’s The Doll Daze (pictured left). To cop her six-song EP, follow this link. Hey... how about a battle of the bands between Brooklyn and Atlanta black rocker chicks? I liked "Pearl." Three5Human (cool name) sounded sort of Betty Davis-ish. Yeah, Brooklyn would crush. Unless Mother's Finest stood up for the ATL. Res is new to me. Good CD? Looking at the CD right now. One of the executive producers is Santi[gold] White. Thanks for posting these tracks UBM. NeoSoul puts me to sleep. Sometimes you just need to rock out. I was playing the originals to every new song that samples songs from the '80's for my little cousins. They had no idea how much influence early Mtv videos had on today's popular Black music. What's up in Virginia Beach? T. Riley, Kenna and Pherell are all on the rock tip. Wow. This blog will keep me occupied for years. Here's a new one for you (in this category): Sistas In The Pit. Believe they're from No. Cali. and are a favorite of Mike Watt. They definitely rock.